Greatest Racing Series Ever: AMC vs Austin vs Hindustan Ambassadors! While the penumbral financial backers of my DUI Telepresence Crown Victoria Figure Eight Racing series shovel rubles into briefcases, I'm moving on to an even bigger Greatest Racing Series Ever™: Last-man-standing road racing of the three great automotive Ambassadors! Greatest Racing Series Ever: DUI Telepresence Crown Victoria Figure-Eight Racing! Think about it— India's Hindustan Motors Ambassador, based on the 1948 Morris Oxford and still being made today, is made to handle the madness of South Asian road conditions. Meanwhile, the AMC Ambassador was built from super-beefy Kenosha steel and powered by a bulletproof AMC V8 engine. What could possibly compete with these two legends? 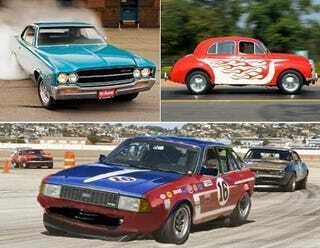 Why, the Princess-derived Austin Ambassador, a car that may well turn out to be the toughest endurance racer of all time! And what sort of race format would be best for these fine competition machines? Sure, an endurance race on a challenging road course— or maybe city streets— would work, but there'll be none of this time limit stuff for the Ambassador Global Challenge! Those slackers who run the 25 Hours of Thunderhill will hang their heads in shame after they find that the winner of the Ambassador Global Challenge will be the car that finished the most laps by the time the final competitor stops moving. That's right, all but one of the cars will be driven to death! There's no telling how long the race will last! Days! Months! Each team will be allowed a total of one hour of pit stops per 24 hours of racing, and they'll have to fit fueling, tire changes, driver changes, repairs, everything into that time. They'll want to have a lot of drivers and many parts cars. Now, a 401-powered AMC Ambassador should be able to get around the track the fastest, but the Hindustan Ambassador's design has nearly six decades of real-world destructive testing behind it. The Austin Ambassador has the most sophisticated brakes and suspension of the trio, so British Leyland might just take the whole show!